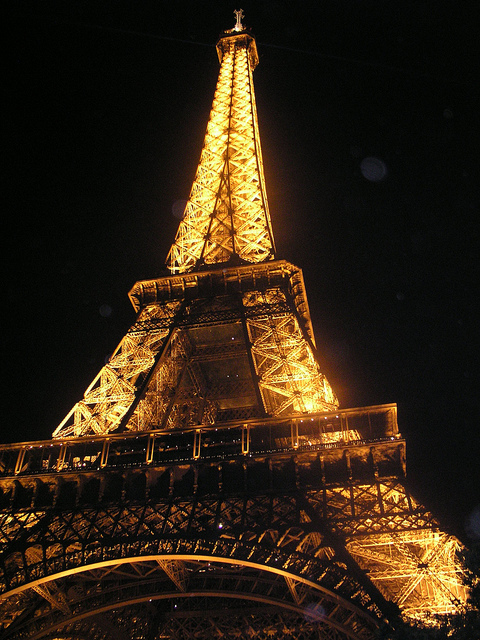 From the age of eight, I have dreamed of living in Paris. I started learning French in second grade, the same year a family friend returned from his junior year abroad in France. I adored looking at his post cards and photographs and vowed that one day I would see these glorious sights, especially the Eiffel Tower, for myself. In 1977 my dream came true. Our high school offered an exchange program with a high school in Arcachon, France. We would travel to their home town for three weeks (with a brief side trip to Paris) and the next month they would visit us in Connecticut. On a cold February afternoon the charter bus pulled up beside the Trocadero platform. We quickly disembarked. It was drizzling rain, but we didn’t care. This was the Eiffel Tower! My friend handed me her camera – a Kodak instamatic – and asked if I would take her picture. She would then reciprocate. Of course I agreed. Jen ran ahead to pose as I made sure the camera was ready to go. Behind me I thought I heard someone ask, You like? You like? but I ignored the voice. Who would be talking to me? Jen was ready. I lifted the camera to my face. You like? You like? This time the voice was louder – and closer. I snapped the picture and then heard again. You like? You like? A bit agitated, I turned around to see who was talking so loudly. And there, dressed in only an overcoat, open wide … was an old man wearing a black beret, a sleazy smile, and asking me once again if I liked. I didn’t know what to do. I was a naive seventeen-year-old girl. I ran straight to the bus and sat down. Fortunately no one asked why I was the first one to return. I was too embarrassed to share the experience with anyone. 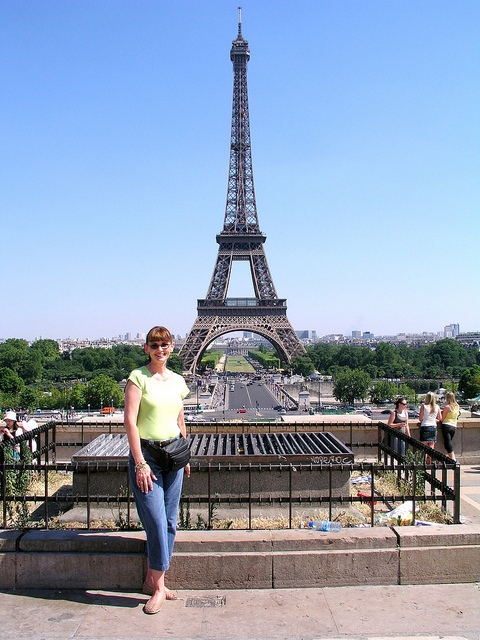 I never got my picture in front of the tower. And quite frankly, I never cared if I saw the Tower again. Fast forward to July, 2006 — nearly thirty years later! I had scheduled my first group tour to Europe and qualified for a leader training session in Paris. We were there only two days, but I was determined to see as much of the city as I could – including the Tower. I must admit I was a bit nervous walking from the Metro station to Trocadero Square. Although the weather was warm and no one wore an overcoat, I still maintained a keen awareness of all those around me. A fellow teacher asked if I would take her picture. She would then reciprocate. Talk about deja vu! I lifted the camera to my face, half expecting to hear You like? You like? behind me. But the only voices I heard were fellow tourists, as excited to see The Eiffel Tower as I was. I finally had my picture taken with the Iron Lady – and we made amends. Now look at her fondly instead of disdain. She has become a close intimate friend whom I must visit anytime I’m in town. No matter where I am in the city, I look for her silhouette, and she always brings a smile to my face. I enjoy her company in the daytime, sitting on a park bench sharing my lunch with her — and I enjoy her in the evening as she illuminates the City of Lights. At the top of each hour her lights twinkle, and for those few brief moments, she is magical. What a wonderful story! I love that you finally were able to get that photograph with the Tower! And I love how you describe your relationship with this special lady! Thank you for sharing! Thanks so much for stopping by, Suzanne 🙂 It is indeed a story to remember, that's for sure! 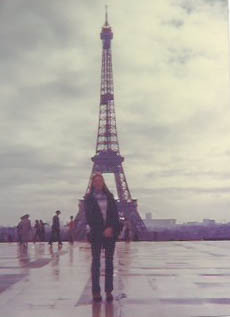 Nice photo of you and the Tower from 1977 to 2006. You never forget memories like those!